Pittsburgh Pride is the largest community festival that celebrates the diversity of the region specifically for the LGBT (lesbian, gay, bisexual, transgender) community and its allies. It is the largest Pride event in Pennsylvania and the 4th largest special event in the City of Pittsburgh. The Equality March, with over 130 contingents, is also now considered among the largest parades in the city. Unlike other events, Pittsburgh Pride is different and provides a unique opportunity to align your company externally with the LGBT community and also internally with your company’s diversity and inclusion efforts. Pittsburgh’s first Pride march took place on June 17, 1973, only four years after the Stonewall Riots in New York City. The Delta Foundation of Pittsburgh, the region’s leading LGBT advocacy organization, has been proudly producing Pittsburgh Pride for the past 12 years and has grown the event from 2,800 people in 2007 to over 185,000 in 2018. Pride is uniquely personal. Ask a group of people what Pride means to them and you will get all kinds of different answers. For the 19-year-old who just came out, it’s a chance to be with people who are just like him. For the lesbian couple, it’s a chance to walk proudly down the street hand-in-hand with the person they love. For the black trans woman, it’s a chance to learn about important resources in the community that are critical for her survival. For the young gay man, it’s where they can get tested for HIV and STI’s and learn about PrEP, a pill that when taken daily prevents the spread of HIV. For our allies, it’s an opportunity to visibly show their support for their family, friends, and co-workers. Our community continues to face many challenges. Pennsylvania still does not have a state-wide anti-discrimination law protecting sexual orientation, gender expression and gender equality. Our trans community, especially trans people of color, continue to face challenges when it comes to education, housing and employment. There’s a continual push for cultural competency when it comes to healthcare. And our wellness initiative, including PrEP education and access to testing in order to stop the spread of HIV and STI’s, has become a model for other cities across the U.S. By sponsoring Pittsburgh Pride, companies are demonstrating through their actions that LGBT people are welcome in their workplaces and communities. It also gives you access to the community through a partnership that provides you with exposure all year. We invite you join us as we work together to make Pittsburgh the most livable city for ALL of its residents! 2019 Key Dates SATURDAY, JUNE 1 OR SUNDAY, JUNE 2 Ready. Set. Pride! The official kick-off to Pittsburgh Pride held on Ellsworth Avenue in Shadyside, where Pittsburgh’s first Pride events occurred. SATURDAY, JUNE 8 & SUNDAY, JUNE 9 PrideFest A two-day free festival that showcases entertainment, attractions, and vendors in an atmosphere that brings together our allies and celebrates the LGBT community. FRIDAY, JUNE 7 & SATURDAY, JUNE 8 Pride Rocks PGH A two-day, concert which features national entertainment. Past headliners have included Troye Sivan, Kesha, Jennifer Hudson, Nick Jonas, Adam Lambert, and Patti LaBelle. SUNDAY, JUNE 9 Equality March Pittsburgh’s most colorful march which uses the power of our voices and presence to ensure that everyone is acknowledged, included, and treated with dignity and respect. the 2nd largest Pride organization fan page in North America & the largest fan page of all the special events in Pittsburgh. vendors at PrideFest – a new record! sponsors in 2018 – are you ready to join us? LGBT Facts & Figures • There are approximately 9 million members of the LGBT community in the U.S. This number would indicate that the community is larger than the population of 40 American states. (Williams Institute) • One in four LGBT employees report experiencing employment discrimination in the last five years. • Nearly one in 10 LGBT employees have left a job because the environment was unwelcoming. • 8 percent of LGBT employees report that discrimination negatively affected their work environment. • The Transgender unemployment rate is three times higher than the national average. • Over one quarter (27%) of transgender people who held or applied for a job in the last year reported being fired, not hired, or denied a promotion due to their gender identity. • More than three-quarters of transgender employees take steps to avoid mistreatment in the workplace. Pittsburgh Pride would not be possible without the support of our partners. Letâ&#x20AC;&#x2122;s add your company to this list! Event Naming Rights Opportunities Partnering with Pittsburgh Pride gives you access to the community in a myriad of ways depending upon your goals and budget. It’s a way for you to increase your visibility and brand recognition to the LGBT community, engage future consumers, generate employment opportunities and support progress and equality for all. Below is a list of possible events that are available for your consideration. Pride Rocks PGH Pride Rocks PGH is an outdoor ticketed concert and dance party that has played host to major national entertainment including Jennifer Hudson, Patti LaBelle, Melissa Etheridge, Adam Lambert, Nick Jonas, and Kesha. Pride Rocks PGH is the can’t-miss event in town and as the title sponsor, your company has the opportunity to be a part of Pittsburgh’s most exciting and talked about event! PrideFest PrideFest is a free two-day festival that attracts over 185,000 people from all over the region. The festival provides a opportunity to showcase the strength of the LGBT community and bring our allies to an event where diversity is celebrated. The 6 block festival includes several stages of entertainment, 175 vendor booths, food tents, a children’s activity area, wellness village, public safety area, and pet pop up area, just for starters! Join us as the title sponsor and your company can align itself with the largest event of Pittsburgh Pride! Ready. Set. Pride! Ready Set Pride! takes place on Ellsworth Avenue in Shadyside, which is one of the original locations of Pittsburgh Pride. Now in its 5th year, this event is the official kick-off to Pride and is held outside with entertainment and dancing in the street. Custom signage and branding opportunities are available. Fabulous Gay Friday Fabulous Gay Friday is a fun and free lunchtime entertainment event held in Market Square which brings together the corporate community and the LGBT community. Held in downtown’s most popular gathering spot, past performers have included dance diva Martha Wash and RuPaul’s Drag Race contestant and Britney Spears impersonator Derrick Berry. Custom branded signage opportunties are available. Rainbow Run Lend your company name to the first Rainbow Run, a 5K Run/1 mile walk. Working with our partners at Pittsburgh Three Rivers Marathon, this timed race can give you the opportunity to show your support of the LGBT community with custom signage while promoting a healthy social experience in a family-friendly atmosphere. Opportunities to Sponsor at PrideFest PrideFest offers multiple opportunities for your company to be involved in the largest LGBT event in Western Pennsylvania! With over 185,000 attendees, multiple marketing opportunities are available including title sponsorship with customized signage and on-site engagement including contesting, sampling, and couponing. We welcome the opportunity to work with you to develop a customized proposal based on your marketing initiatives, goals and budget! Our attendees are coming to Pittsburgh not only to attend Pride but also to visit our restaurants, bars, and hotels. Sponsoring the Information Tent at Pittsburgh Pride with your company brand gives you the chance to promote your name to festival goers seeking out information about Pittsburgh Pride as well as provide general information about Pittsburgh. The lost & found and first aid area will also be located here. Showcase your brand at this popular area filled with an array of something for every taste bud as well as providing a place to sit and eat during the festival. Exclusive soda pouring rights are available with this sponsorship. A popular stop in the festival for the young and young at heart. This area is filled with extremely popular inflatables as well as a crafting area and face painting. Sponsoring this area will showcase your company to both traditional and nontraditional families. Now in its 5th year, the Dance Party Area is where you can let loose and dance to a wide array of musical genres programmed by local DJs. Custom branded signage is available at this unique area. Restroom Row Restrooms have been a primary talking point the past few months because of North Carolinaâ&#x20AC;&#x2122;s HB2 bill which discriminates against people using the restroom based on the gender they identify. Companies like Target have taken the position that people should be able to use whichever restroom they feel most comfortable in which has lead them to huge positive brand recognition in the LGBT community. Sponsoring the restroom area at Pride with your brand would give your company a unique ability to not only promote that you too believe that people should be able to use any restroom they wish but could also create an interesting PR opportunity. Entertainment Stages Pittsburgh Pride is reknown for its diverse line-up of entertainment. From our Pride in the Street concert fundraiser to our free multi-day PrideFest festival, we invest in bringing local, regional and national entertainment in all forms to Pride to showcase their talents. From drag to dance and everything in between, this entertainment takes place on three stages throughout the festival. Sponsoring a stage gives your company the opportunity to align itself with one of the key features of the festival which will be seen by tens of thousands of people. Custom signage on the stage is available with this sponsorship. One of the unique features of Pittsburgh Pride is that it is a licensed event to sell liquor, beer and wine outside on the street. Throughout Pride there are fully-staffed, very popular bars with a wide array of offerings. Sponsoring the bars would give your company the opportunity to solidfy your support of the LGBT community. Exclusive pouring rights are available with this sponsorship as well as logo identification on beverage cups. Relax & Recharge Area The Relax & Recharge area is a shaded place where people of all ages can take a break during the festival. This area is unique as it gives your company the opportunity to speak one on one with people as they sit for a bit, recharge their cell phone, or grab a cold beverage. Ticket Gate Entrance at Pride Rocks PGH Concert Probably one of the more exciting areas, the ticket gate entrance to the Pride Rocks PGH Concert is the first opportunity any company can have to engage with attendees! Barricades offer unique signage opportunities as well as the ability to distribute product or giveaways. Having access to cash that is close and convenient is something we’ve heard is important to our visitors. In 2015, nearly $100,000 over two days. Your company can be the “hero” and sponsor this busy area at Pittsburgh Pride. In 2016, the first Wellness Village was set up at Pittsburgh Pride as part of a 6 month initiative, to encourage the community to get tested for HIV and STIs as well as start the conversation about PrEP, a pill that when taken daily prevents the spread of HIV. In three years, nearly 900 people have been tested for HIV and STIs at Pittsburgh Pride. Sponsoring the Wellness Village not only will provide the opportunity for people to get tested for free, many of which don’t have access to resources where they live, but also 17 provide them with life-saving education. Studies show that attendees believe that LGBT rights and climate change are both human rights issues. 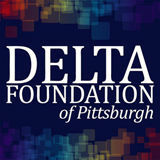 The Delta Foundation of Pittsburgh is committed to making Pittsburgh Pride a â&#x20AC;&#x153;zero wasteâ&#x20AC;? event and our efforts have been recognized by the Pennsylvania Resources Council. Your company can join us as a sponsor of this initiative which will promote a positive and responsible image to our attendees, vendors, and volunteers. Everyone who visits our Food Vendor Area will see your company name and logo when you participate in our picnic table sponsorship program. Custom branded stickers will be affixed to approximately 40 picnic tables giving you an unique and interesting branding opportunity! Pittsburgh Pride Magazine Reservation deadline: March 1 | Material deadline: April 12 | Street date: May 6 The Pittsburgh Pride Magazine is a glossy, full-color magazine filled with anything and everything about Pittsburgh Pride including a comprehensive calendar, maps, feature articles, and information about each of our events. It also includes upclose and personal interviews with local leaders and national artists who will be performing at Pittsburgh Pride. 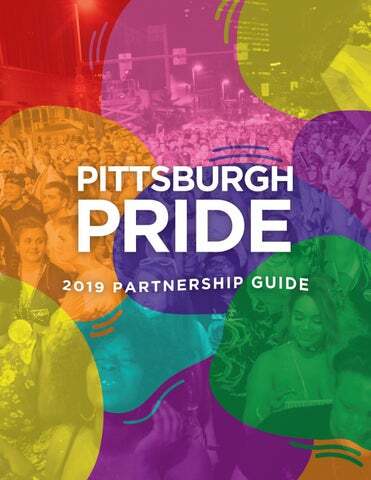 Pittsburgh Pride Magazine distribution will also occur at partner businesses in Pittsburgh, Cleveland, Columbus, Erie, Wheeling, Steubenville, and Morgantown just to name a few! With the purchase of an ad, your business or company will be listed in the “Pink Pages” of the magazine. Over 20,000 magazines will be printed and distributed all over the tri-state area at the beginning of May. An online copy of the publication will be available on PittsburghPride.org. 1. All GIFs and PNG files. Anything pulled from the internet has the chance of being unusable. 2. JPEG or TIFF files: only acceptable at the exact size of the ad at 300 dpi. TIFF files must have no layers. Save JPEG files as high quality - and NOT optimized for web. Color mode: CMYK. 3. EPS file: You must either RASTERIZE, or CREATE OUTLINES of the fonts used in your .eps file. Since EPS files can be heavy file sizes, we can accept them on CD, FTP download, or email. 2. Some JPEGs. Photos downloaded off of the web (unless from a stock photo site or other high resolution online phot resource) will NOT reproudce in print. Using any image you pulled form the homepage of a website will make your ad pixelated. 3. RGB is the wrong color mode, switch to CMYK. 4. Native collected ad layouts, images, and fonts for Quark, Photoshop, Indesign or Illustrator are usable, but they are not preferred. 5. Office progams such as MS Word or MS Powerpoint, and similar progams are not acceptable. Advertising disclaimer: All display ads that contain problems such as (but not limited to) grainy image quality, image pixelation, low resolution, wrong file format, wrong size, incorrect information, misleading information or typographical errors are the sole responsibility of the advertiser and is not the responsibility of Pittsburgh Pride Magazine, the Delta Foundation of Pittsburgh, or its volunteers, employees, affiliates or partner organizations. *For the purpose of advertising rates, to be eligible for a Non-Profit Rate, the purchaser must be recognized by the Federal Government as a 501(c)(3) charitable organization. These terms and conditions shall be deemed incorporated into every insertion order, space contract, or uncontracted advertisement to Pittsburgh Pride Magazine unless specifically modified in a written agreement signed by the Delta Foundation of Pittsburgh. Furthermore, advertisements are accepted only under the condition that the adver- tisers assumes liability and responsibility for any legal claims resulting from advertisement being printed or not printed. Pittsburgh Pride Magazine reserves the right to refuse any advertisement without explanation. Payment for an advertisement is admission by the client that all materials used (claims, logos, photos) have been obtained legally, with permission of respective parties and that model releases were signed with permission to be published in Pittsburgh Pride Magazine.